You wouldn't guess it given the bright, mostly balmy (for not quite spring) weather we're having, but just two weeks ago, we went sledding. It was splendid...with a bump. And both splendor and said bump kicked off a big, extended craving for comfort food...and comfort. Sometimes, beginning Friday evening, Dave shifts out of his usual Fun Dad mode and becomes FUN DAD ON THE WEEKEND (!!!!). This is wonderful, except. Sometimes that means I move over a gear or two as well. From Fun Mommy (I think/hope) to a just-ever-so-slightly ready to be competitive mama lest FUN DAD threatens to one-up me. This results in occasional poor decision making. Cause-effect. It's that simple, but mostly in hindsight. So we were all sledding and having a blast at Wonderland Lake in Boulder, when FUN DAD and Chef F took off together on the green sled over a wee little jump. It looked like fun, so when Chef F swapped to my more compact, faster, orange-rainbow sled, I decided we'd attempt the nearby BIGGER jump together. Of course, I didn't really want to. I even had one of flashes of foreshadowing telling me, don't do it, fool. But Dave didn't seem to question it, so I thought it would be just fine. It was not fine--but luckily just with regard to me. Long story short, I learned my lesson. I remembered I am older now. I paid for the failure to use my beautiful brain with all kinds of weird compensatory things throughout a two week span, such as a tightness in my back resulting in a twinge in my left calf and some strange nerve triggers that made my left arm randomly feel like I spilled warm water on it. Good news, I'm not broken. In fact, two weeks later running and moving just generally feel back to normal. And I have some yummy comfort dishes to look forward to repeating that were most certainly kicked off by the craving for some soothing goodness. This pot pie is delicious. Bubbling, aromatic tempeh and vegetable filling with a sweet potato biscuit topping that happens to be oil free. The topping could be my favorite part, in fact, mainly because Chef F took me by surprise by loving them, and what he loves, I love. It's all easy to put together yet has that homey, impressively "from scratch" quality that implies a lot more effort went in. We hadn't had pot pie in ever so long, and this really hit the spot. There's a fine line between comfort food and caving to comfort eating. But Chef F and I made parts of this together. And comfort cooking shared with loved ones is always worthwhile and 100% guilt-free. Heat a large skillet coated with cooking spray over medium. Add cubed tempeh, garlic, onion, and mushrooms and cook, stirring regularly, about 3 minutes. Add green beans and carrots and continue cooking 3 minutes more, stirring occasionally. Add white wine, herbs and veggie stock and heat until gently beginning to bubble. Sprinkle tapioca flour over surface and stir to evenly combine. Continue cooking over medium heat a further 5 minutes, until vegetables are just tender. 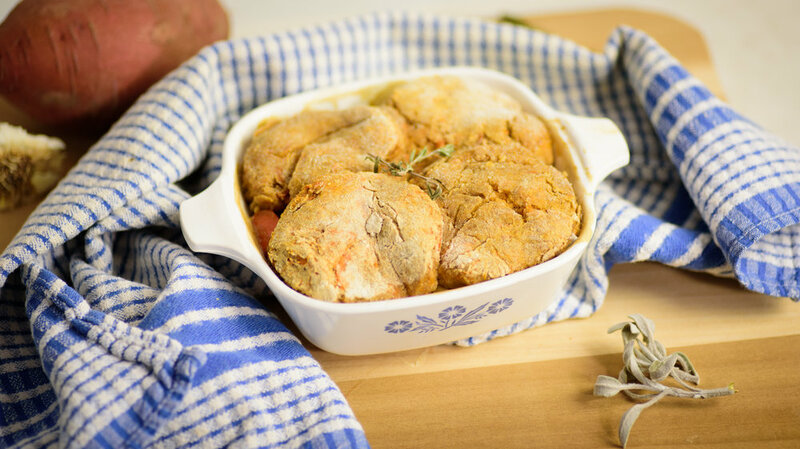 Transfer to an 8 x 8 casserole dish or into individual small casseroles or ramekins. Preheat oven to 400F. Prepare the biscuit topping: Remove sweet potato meat from skin and transfer to a mixing bowl; mash well. In a separate bowl (ok, I just use the same bowl actually), combine the dry ingredients (flour, baking powder, baking soda). Add aquafaba and almond milk, and stir to combine all ingredients to a sticky dough. Sprinkle rice or other additional flour as needed to form a workable dough. Remove dough to a flat prepared surface and flatten to about 3/4 inch thickness. Use the rim of a glass or cup to cut into individual biscuits. Place biscuits to cover filling. Bake at 400 F for 20-25 minutes, or until topping is cooked through.